The theoretical ability of modular robots to reconfigure in response to complex tasks in a priori unknown environments has frequently been cited as an advantage and remains a major motivator for work in the field. We present a modular robot system capable of autonomously completing high-level tasks by reactively reconfiguring to meet the needs of a perceived, a priori unknown environment.The system integrates perception, high-level planning, and modular hardware and is validated in three hardware demonstrations. 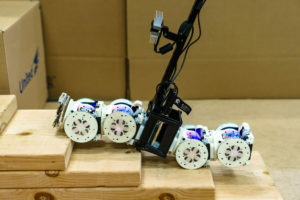 Given a high-level task specification, a modular robot autonomously explores an unknown environment, decides when and how to reconfigure, and manipulates objects to complete its task. The system architecture balances distributed mechanical elements with centralized perception, planning, and control. By providing an example of how a modular robot system can be designed to leverage reactive reconfigurability in unknown environments, we have begun to lay the ground- work for modular self-reconfigurable robots to address tasks in the real world. J. Daudelin$^*$, G. Jing$^*$, T. Tosun$^*$, M. Yim, H. Kress-Gazit, and M. Campbell, “An integrated system for perception-driven autonomy with modular robots,” Science robotics, 2018. Nov 01, 2018 | Filed under Modular Robots and tagged with tariktosun.